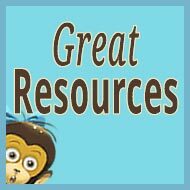 A few weeks ago I shared two excellent books on early child bilingualism in the post Recommended Resources: Books on Bilingual Acquisition by Prominent Researcher Annick De Houwer. Along with my impressions of these books, the post included an insightful interview with Dr. De Houwer and a book giveaway, which generated a number of questions from this audience. Dr. De Houwer, a professor of Language Acquisition and Multilingualism at the University of Erfurt in Germany, generously offered to respond to some of these questions (and expressed regret at not being able to respond to everyone). 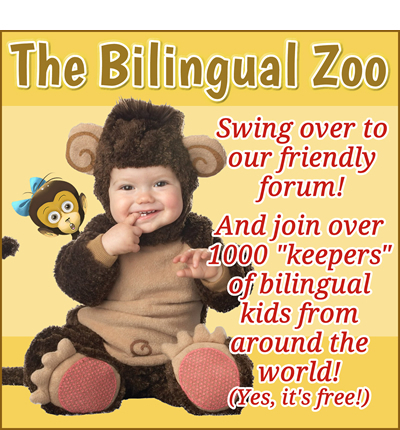 On behalf of us all at Bilingual Monkeys and The Bilingual Zoo, let me thank Dr. De Houwer for her helpful thoughts today, and more broadly, for the important work she has long pursued to shed brighter light on child bilingualism. The world’s bilingual families are very grateful! Question from Elodie in Germany: Can bilingualism not happen, even if the parents do everything that can be done? Can children resist that much that it will never work? 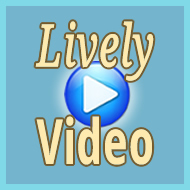 Question from Lainy in the U.S.: I’d like to know some strategies to get my children to produce the second language. They understand the spoken language very well, but they are hesitant to speak it. Question from Stephanie in Japan: What I really want to know is how best to divert the child back into speaking the target language when s/he responds in the “wrong” language. Currently we ask our daughter “How do you say that in English?” Or we say “Please speak to Mama in English”. But I’ve heard from several friends in child development that children can’t actively distinguish between languages until age 4, so I am a bit confused as to whether that’s true (in which case I should just tell her the word in English?) or if that’s not true and I should continue as we have been doing. Response from Dr. De Houwer: Indeed, children can strongly resist speaking a particular language, Elodie. 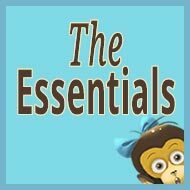 In the preschool years there certainly are strategies that you can use to counter this. Using the names of languages, Stephanie, will not be particularly helpful, though. If very young children are not using the language you want them to speak, you can do various things to try to get them to change. You can ask: Oh, did you mean so-and-so, where ‘so-and-so’ is the word or phrase in the language you want them to speak. If they say yes, then ask them to repeat what they meant, so you can properly understand them. Or you could say: I really don’t understand that word very well, can you say it differently? (That’s if you think children know the word in the ‘right’ language.) You can try this for a few weeks and often this will be enough to switch very young children over to the ‘right’ language but sometimes that doesn’t happen. Then you could bring a cute hand puppet into the house and tell your child that this puppet only understands Polish, or Spanish, or whatever language you want them to speak. And then…it’s time for your talents as a puppeteer to develop! 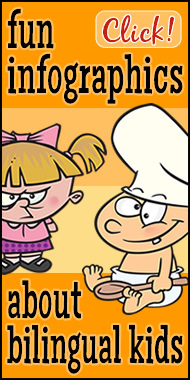 Play games with your child and the puppet, so that your child gets into the habit of using the right language. Now with older children I’m afraid it’s nearly impossible to change ingrained habits of using language X with a parent who speaks language Y to them, but it is worth talking to them about it and explaining that you understand that they don’t feel good talking a language they have little fluency in, but that it’s really important to you that they speak your language. Educate your school aged children about your language, and show them (online perhaps?) children who speak it. Try to increase their motivation to speak it, and put them in circumstances where in order to say anything they must use it, because the person they’re talking to doesn’t know another language they know. 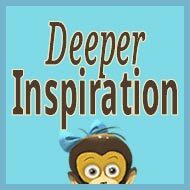 Question from Nicola in the U.S.: What constitutes “speaking to the child” when doing OPOL? I only address my son in German, but speak to my husband in English. How important is it for me just to speak the minority language in front of my son? My husband understands German but isn’t fluent and I am very used to speaking English with him, so it’s proving hard to change that. Response from Dr. De Houwer: Your son will know that you speak two languages. He will know, not only because of how you talk to your husband, but also because he hears you speak in other settings outside the home. Because of that, he may speak only English to you, but there are strategies to counter this (see the first response). 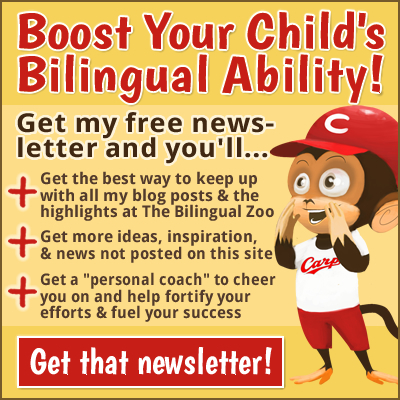 Question from Christa in the U.S.: What is the best way to ensure that younger siblings stay bilingual when older kids are naturally exposing the younger ones to the majority language at home? Response from Dr. De Houwer: Older siblings may themselves speak the minority language at home, or they may speak both languages at home. It is not a “given” or “natural” that they do not speak the minority language at home: in 70% of the families in my large survey all children in the same family spoke the minority language. But if older siblings do speak only the majority language at home, it will be difficult to ensure that the younger ones speak the minority language at home. The firstborn child, then, plays a key role. Your chances of having children who speak the minority language are higher if you speak a lot to children in the minority language and if you use communication strategies that make it natural for children to answer back in the language they are addressed in (again, see the first response). Question from Ruth in New Zealand, seconded by Martina in Slovakia): When is a good time to introduce the home/minority language as a written language? Can the writing/reading of two languages be taught parallel, or is it better to wait for a general grasp of the first before starting the second? Question from Tatyana in the U.S.: I loved Dr. De Houwer’s research paper on statistical probability of a child speaking a minority language based on the languages parents speak at home. However, I would like to see what the numbers end up being if instead of language spoken at home, the question was asked on what language(s) parents spoke to the child and separately what language they spoke to the spouse. I think a lot of bilingual parents want to know what the effect of spousal communication is on the child. Response from Dr. De Houwer: Unfortunately we don’t know much about the effect of the language that parents speak amongst themselves. Children will be overhearing that language. In my own research I am collecting data on this and will try to see if and how parental language choice in conversations with each other affects children’s development. Question from Sonja in the U.S.: I’d love to hear Professor De Houwer’s perspective on mothers speaking a non-native language to their children to encourage bilingualism. Italian is not my native language but I lived in-country for 6 years and have a good command of the language. Sometimes I wonder how my speaking Italian to my son may affect the emotional bond we are creating in his early life. I know my ability to express myself without errors and naturally is not as good in Italian as it is in English. I’ve been speaking to him exclusively in Italian (unless in the company of others who don’t understand Italian) but due to my concern about emotional bonding, I’m seriously thinking of scaling back to only one hour per day or only during specific activities (like during our evening walks). Response from Dr. De Houwer: In principle I would not recommend speaking a language to your child that you didn’t grow up in yourself. That’s because this usually means you don’t know children’s songs and rhymes in that language, and, usually, people feel an emotional distance from a language they learned only later in life. That’s very personal, however, and I know that parents differ on this. In your case, Sonja, I would not give up the Italian at this point, because your son is at the age where he is starting to understand words and where he has already made a connection between yourself and the language you speak to him, and you don’t want to put that at risk. But perhaps you can add English to the conversation, and see how he responds. Your son has likely heard you speak English to others, so may not wonder too much that you can also do that when you talk to him. If he doesn’t get too upset if you speak English to him, you can then continue to use both languages with him, and you will probably fall into some “natural” pattern in terms of what language you use with him in what circumstances. But of course, if your aim is for him to also learn to speak Italian, he would greatly benefit from contacts with other children who are learning Italian, and from many trips to Italy! Question from Emilia in Italy: We used to be a home where Italian and Spanish were used in equal amounts, with an OPOL approach. When our little boy arrived, we decided to add a second non-native foreign language, English. Can speaking different languages with different children be confusing for the kids? I hope not. Response from Dr. De Houwer: In general it is not a good idea to treat children in the same family differently as far as language choice is concerned—so, the language(s) you speak to a child. Children can easily feel left out if they are the only one you speak a particular language to, or the only one you don’t share a particular language with. Language has symbolic meaning and expresses a feeling of belonging (or exclusion!). That’s very noticeable in a bilingual setting and shouldn’t be forgotten. Question from Joana in Spain: I read books in our minority language (English) to our daughter since birth, but sometimes my husband takes our English books and translates them into Spanish or Catalan to her. Could that be confusing for her? Response from Dr. De Houwer: Rest assured, Joana, that your daughter will not be confused if she hears the same books discussed in three languages. Rather, she will learn to draw the connections between what she sees in the books and the words used to talk about them, regardless of what language is used. Bilingual (and trilingual!) children can handle this very well. Their capacity for language learning is far greater than we often think! But frequent repetition of words is important for children to be able to learn them, and it is great that both you and your husband are reading books to your baby. 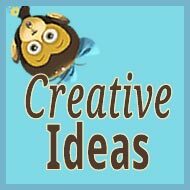 Question from Ming in Germany: As my kid is born in Germany and we are Chinese family, I’m personally interested in the topic of bilingualism and eager to know how my child can become later in his life as biliteracy of the two languages, instead of losing his first Chinese language. Some related questions, such as will his German language competence be at the same level as monolingual German children in general? 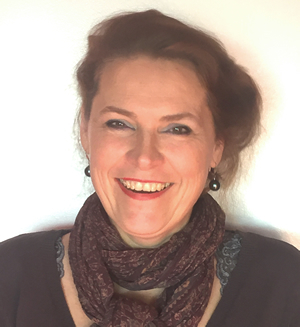 As Professor De Houwer in her new project, Harmonious Bilingual Development (HBD) proposes for a positive and neutral language environment without feeling of frustration, as parent, we want to know more about some practical method or strategies both at home and in the public that can support bilingual children. And I believe as adult that communication is also important for one’s character development. A successful communication will help people to feel more confidence and be positive motivated for further language improvement as well as in other spheres in the life. I appreciate very much for the research findings that Professor De Houwer has done for our benefits, for the parents and kids, and we are looking forwards to knowing more about HBD and its new findings that will be definitely helpful for children who acquire more than one language. Response from Dr. De Houwer: Ming, if your child continues to live in Germany and will attend a German school, then his German will rapidly improve. Whether it will be on a par with monolingual German children—well, I’m not sure you want that, necessarily? There are many normally developing monolingual children who have a very low vocabulary, and who cannot speak very fluently. There is a lot of variation both within monolingual and bilingual children, and whether they are growing up with just one or two languages doesn’t really have much to do with how well they learn to speak a language. 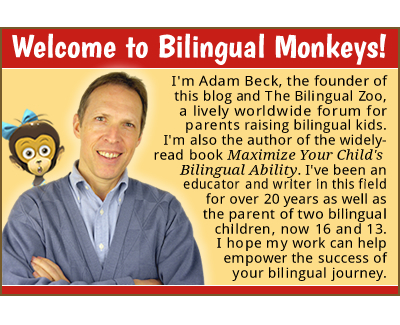 For tips on how to make sure your child develops well in all his languages, I can highly recommend Adam Beck’s book! 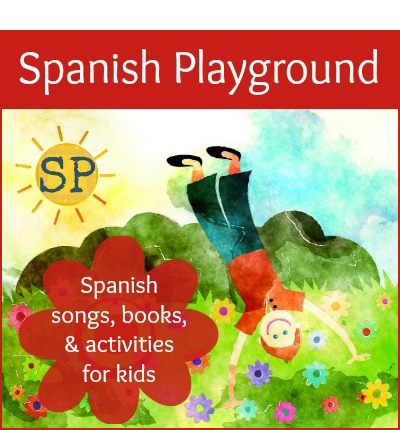 [Maximize Your Child’s Bilingual Ability] It is a great resource and a pleasure to read. Question from Pamela in Germany: My question is, where does the boundary between BFLA and ESLA lay specifically? My daughter was 1 y.o. when we moved to Germany and was 1.5 y.o. when she went to German daycare. She was not speaking almost any Polish at all when she first went to daycare. Which path of language development she’s likely to follow? And a related thing: my son was 6.5 y.o. when we moved to Germany and after more or less two months at a German school he was perfectly able to communicate and understood most of what was going on at school. Now, after a year, he has no problems with German outside of school, too. Is 6-7 y.o. “too old” for ESLA and following some other, more “adult” path of language development, or is he likely to fall in the bilingual category, similarly to my daughter? Response from Dr. De Houwer: The boundary between BFLA and ESLA lies pretty much at birth. This is because children are already learning about different sounds right after birth (and there is language learning before birth, too), and if they do so in two languages simultaneously, there is no first language that can have an effect on the second. Your daughter has already been following the ESLA path, because she certainly understood a lot of Polish at age 1.5, and started to understand German much later (learning to speak is only part of language development). 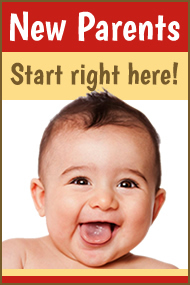 The term ‘Early Second Language Acquisition’ is used for children who have had no formal literacy instruction. Your son was at school age when he started to attend school in German, and is in the process of also acquiring literacy in it. There is no specifically child or adult path towards learning a second language, and everybody who has learned to use two languages to some degree and uses them regularly is a bilingual, not only children with input in two languages from birth! 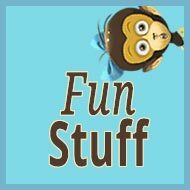 Have you tried my fun quiz, based on information from Dr. De Houwer’s book Bilingual First Language Acquisition?